The Department of Public Transportation said they would like to advise the public of bus cancellations today [Sept 21], and provided a list of the cancelled routes. The cancellations also occurred last week, and in explaining why, a Transport Ministry spokesperson previously said, “The Department of Public Transportation went through a period where there was a huge spike in vehicles coming out of service for various reasons including accidents, tire changes and small electrical repairs. R u serious! this is just ridiculously crazy! OK so our infrastructure is really going to crept under this govt. Hey PBT, a real explanation would be nice! Who gets paid every month. Who sits on their *** and tells us what to do even here. Can the Bus service explain why everyday we have these cancellations, they are always around 5.00 pm??? Are we to assume the buses ran fine all day but come near 5 pm they suddenly stop working??? Or is this a targeted thing that will get the most impact??? I find the ” conceding every strange that happens just when rider ship is at its highest, you know when people are trying to get home from work and are now left stranded??? I actually look for to the day that the whole bus service is cancelled!!! Putting the BIU drivers out of work and the whole service is replaced with a private service!!!!!! Don’t know where you live Kangoocar but some of your statements make me wonder. Your second last sentence speaks volumes. I live right here Terry, I actually don’t know where u live??? But my second last sentence is tied to the last sentence!!! Being I live here, it really makes me mad at what is going on??? There is without a doubt more to these sudden cancellations ( all around the same time everyday?? ) I am convinced there is more to this than what is being put out to the public??? There is no way all these buses happen to have problems at the very moment the buses are used the most by Joe public??? Can’t you see that??? And if my suspicions are correct, why on earth would I have any compassion for the very people ( BIU/ Union members ) who have been effected the least by this home made by the plp recession Bermuda is having to live through!!!!! Wonder how many else will. Finally got your inner thoughts. Anytime Terry, I only ever say it the way it really is!!! I have prepared for the last 8 yrs to exit whenever I feel I need too, we now have an OBA government that has proven to not have the cohones to deal with the nonsense that has been going on since the DR was elected back in 2005 I think it was??? As you say ” Bermuda is finished ” unless something changes real soon, you will be totally correct!!!! And yet you will never take your vile complaints or solutions to your Transport Minister . Only he has the power to act on your emotions . @coffee, no he doesn’t and you know it, so stop your nonsense!!! he is being spoon fed nonsense from the Civil Service/ bpsu members!!! I have NO problem in saying if he believes the nonsense put out by the them, then I have a bridge to sell him as well??? You being a plp higher up ( your constant lies is a dead give away, ) know very well what is going on here, and you should be remembered as well next election time when your sheeple cast their votes!!!! Kango … Repeating the lie over and over on Bernews isn’t going to prompt the Minister of Trans&Tourism to act . Boldly go and have a word with him . If you wish , I’ll even find his email or phone # for you . I can’t believe “they” are to be liked too much further by the vast majority of we’lot or any other public bus riders…I personally wonder, is this just more union under the table shenanigans? @Raymond, shenanigans is exactly what is going on???? The Pope fly’s over. Sends a blessing. Certain people ‘deflate tires’ et al. Most just talk crap here on tis tv screen. What you gonna do when those three boats turn up off St. Davids light………………. How has PTB made “significant progress in returning buses to service”, yet the list seems longer than the last two?! We demand a statement from the Minister of Trans&Tourism . Not the union , the Minister ! The Minister is getting paid good money after bad to fix this nagging situation . Bermuda is FINISHED!..the plp,biu and that laughable peoples whatever group has seen to that,sooner or later the bank will call in their loans when they cannot pay their loans for their houses and flash cars and boats and only then will people figured out they were lied and conned. I hope it happens real soon! Me,I couldn’t care less about you lot! Hello ~ Is this going to be a regular thing cause I’m coming to visit your beautiful country again and I don’t want to be stranded somewhere because the buses decided to stop. Then get killed walking in the streets with your crazy drivers that I keep reading accidents about. It would be interesting to see what would occur if government were to change the Trade Unions Act 1965 to allow employees to decide to keep their contributions rather than give them to the union or donate them to a charity. Imagine the union members with free will, like god originally desired. Charities would actually have to work for their donations, the unions would have to win the affection of their workers and suffer the same financial drain that everyone else has. Workers could have access to a little bit more of the money they work for. I have heard quite a few union members; civil servants, who do not agree with the way the union acts but do not bother changing their contributions because the money is lost to them anyway. Unions in the 21st century are a scam…. effectively forcing workers to have to pay out of their pocket…workers have no choice. 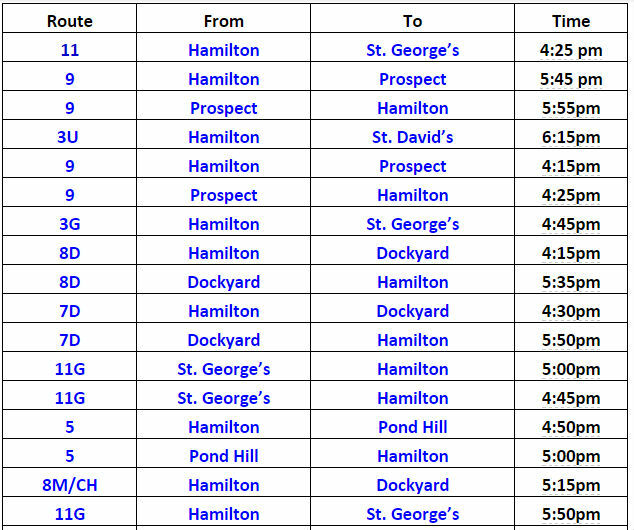 i’d like to see a daily list of bus drivers whose JOBS have been cancelled…then Bermuda can get on with a proper transport system. It’s interesting how it’s now never the Minister’s fault when something goes wrong in the civil service to the OBA supporters. Yet in the PLP administration it was the fault of the Ministers, the civil service, the Unions…the whole nine as one entity. I agree with @Coffee. What is the MINISTER saying on this? Not PTB. The Minister! If this is happening on a continuous basis where is the MINISTER? Too busy hiding behind the issues affecting people, forgetting that this affects tourists as well. I bet if some tourists started screaming loudly about it we will see some response at least to change, because after all the concentration is on the foreigner it seems, not our own. And how much is a Minister’s salary again? CABINET makes the decisions of the country – NOT civil servants. Civil servants enact on CABINET’S (i.e. the elected officials’) mandate, not the opposite way around. These bus cancellations affect the people. What is the MINISTER saying on this??? Some people on this board refuse to see that. So disingenuous.